With Fanfarlo, First Aid Kit and and Radiohead all gracing the great Northwest with their presence this week, it’s hard to believe the European musical lineup could get any better. However, tonight, it does just that. 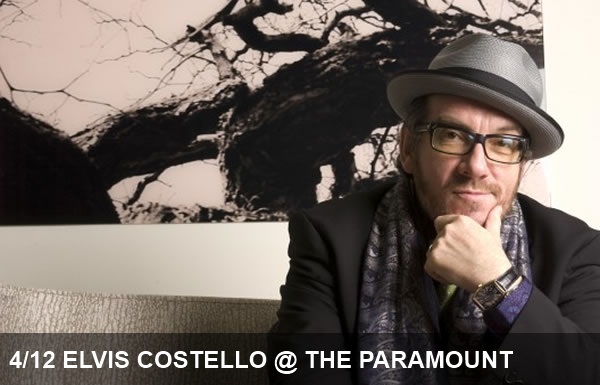 Elvis Costello has been a highly influential mastermind in the London pub-rock scene. With international acclaim, his quirky brand of pun-filled pop tunes have become a staple in well-rounded music collections. Costello’s influence is far reaching with fellow artists as well. He’s done musical collaborations with Burt Bacharach, Paul McCartney, Roy Orbison, Aimee Mann, Green Day, The Strokes and even Fall Out Boy. You might even remember seeing him in the Steven Colbert Christmas Special or in Austin Powers: The Spy Who Shagged Me. There’s even more good news – this show isn’t sold out! Check in with the Paramount Theatre for more details.